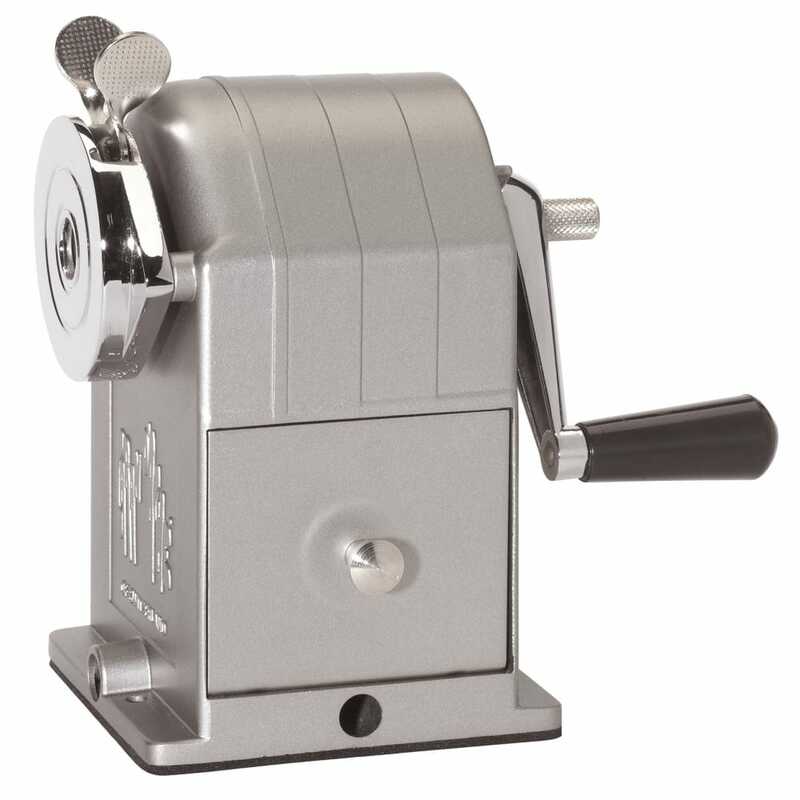 This metal pencil sharpener is crafted with precision and finesse, the Caran d'Ache sharpening machine is mountable to a desk, table or bookcase, sharpening pencils and wax pastels with a long lasting helical blade. Pressing the button at the centre of the crank adjusts the length of the pencils point, while loose shavings are neatly tucked away in the removable metal drawer. Robustly crafted from metal the machine has a wonderful, classical industrial feel and a flawless silver finish. Showing 2 Caran D'Ache Metal Pencil Sharpener reviews. Average rating of Excellent. Would you like to write a review? For different pencils being used in different methods, I therefore need to have control of the length of the sharpened point's, plus clean quality snap free results. I've tried what feels not far off every option out there, not gaining my requirements and quite often getting chewed up pencil shafts due to the sprung loaded holding teeth on desktop rotary sharpeners. Jon and Daniella advised me to look at the Caran d'Ache option. Agreed the price is by far from being the cheapest on the market, but I soon realised why. When you're sharpening expensive pencils such as Luminance, Museum Aquarelle's, Pablo's, Pastel Pencils, Polychromo's etc, you want quick clean shaving, with the minimal waste, no snapping and definitely no chewed up pencil shafts like your dog has been chewing on it. I wished I'd invested in the Caran d'Ache from day 1. It truly is an investment into continued quality control of your pencils in the same quality in which they came from the Manufacturer. You'll also find your pencils will last longer. As always, perfection from Caran d'Ache.